bl.uk > Online Gallery Home	> Online exhibitions	> Asia, Pacific and Africa Collections	> City bazar, Bundi. 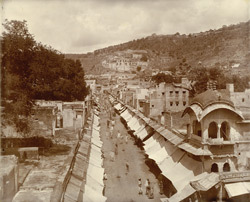 View looking along a bazaar at Bundi taken by Gunpatrao Abajee Kale, c.1900. The photograph is from an album of views of Bundi formerly in the collection of Horatio Kitchener, 1st Earl Kitchener of Khartoum and Broome, (1850-1916), who was Commander in Chief of India between 1902 and 1909. Bundi is situated in a narrow valley within the Aravalli Hills in Rajasthan. It was the capital city of the major princely state of Bundi during the heyday of the Rajputs. The ruling family of the state, the Hara Chauhan clan of Rajputs built a series of impressive palaces, gardens and tanks here, which appear to have been carved out of the hillside in several tiers. The town is full of attractive garden pavilions, step well tanks, temples and chattris, or memorial pavilions. One of the palace complexes of the town can be seen on the hill in the background of this view.